Peterloo, the brutal massacre inflicted on a Manchester crowd demanding political reform in 1819, was a milestone in the lengthy and, some would say, continuing, struggle to establish democracy in Britain and one of the very few radical events to be referenced in the neatly packaged parcel of British history served up at my Scottish grammar school in the late sixties. In little more than a couple of pages we were told of: the March of the Blanketeers; the Peterloo massacre in which 15 people were killed and hundreds wounded; the Cato Street Conspiracy; the 1832 Reform Act; the Tolpuddle Martyrs and the Chartist struggle to extend the franchise. Ireland’s Great Famine received a cursory mention. Scotland’s Highland Clearances did not. The Easter Rising of 1916 was presented, briefly, as an inexplicable nuisance and unhelpful distraction from fighting the Great War. Needless to say, we were not taught any of Scotland’s radical history, let alone Ireland’s. It is simply astonishing that we were taught, no matter how fleetingly, of the Peterloo Massacre but not of the Tranent Massacre of 1797 where 11 people protesting against conscription into the British militia were murdered by English dragoons near Edinburgh. We were told of the mad-cap Cato Street conspiracy (although not of the involvement and execution of the black Jamaican Scot William Davidson) but there was no mention of the Scottish Insurrection of 1820 when nine workers were killed and the leaders Baird and Wilson became the last people to be beheaded in Britain. Most shockingly, while the injustices meted out to the Tolpuddle Martyrs were impressed upon us, the dreadful treatment of the Scottish Martyrs and the trials of sedition that saw the transportation of the advocate Thomas Muir and his associates were never mentioned. My subsequent discovery of these events sparked an interest in radical history, especially in the 1789 -1832 period. 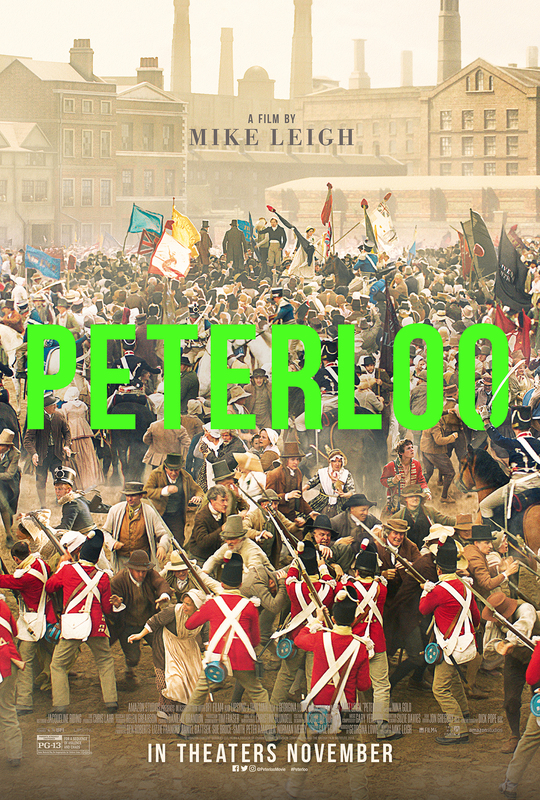 So, it was with a degree of eager anticipation that I approached Mike Leigh’s two-and-a-half-hour epic telling of the story of Peterloo. Sadly, the treatment of this worthy subject never aspired to be anything other than just that – a worthy, plodding, covering-of-all-the-bases devoid of either drama or tension and peopled by one dimensional, wooden characters who seemed like refugees from a bad production at a local repertory theatre. The interminable scene-setting clunked along, utterly bereft of any lightness of touch, to inform us that the backdrop to the agitation was the recession that followed on from the cessation of the Napoleonic Wars and the operation of the Corn Laws. It felt like leaden agitprop. But the well-fed actors failed to convey the true wretched condition of a starving population or the plight of the thousands of disabled and maimed veterans of Wellington’s army who lived on the streets. The Celtic fringes do make an appearance in the film. It is a Scot who throws a stone at the loathsome, pampered Prince Regent in one scene and the camera lingers on a green flag with Hibernia’s harp in the Peterloo crowd, a salute to the Irish presence on the day. This is a welcome recognition of the important role of the Scots and Irish in the movement for Parliamentary Reform. It is worth noting that the London Corresponding Society, the first attempt by ordinary people to organise for the vote, was established by a Scottish shoemaker, Thomas Hardy. When his London home was attacked by a patriotic mob (a crowd which still seems all too easy to whip up), it was a group of 100 Irishmen that came to the rescue. Characterisation is difficult in a movie that is concerned with big social movements but there are some good cameo performances. Rory Kinnear is memorable as a conceited Henry ‘Orator’ Hunt, the main speaker of the day. (He was subsequently jailed for two years, although the audience is never told as much.) Karl Johnson is also good as the stammering and sinister Home Secretary, Lord Sidmouth who developed an extensive network of spies and agents provocateur. Strangely, this lengthy film seems to run out of steam right after the massacre and for all of the vast contextual build up, we are not told of the consequences of Peterloo. It led to the repressive Six Acts and drove the reformers underground and into insurrectionary adventures. But it also led to the foundation of what is now The Guardian newspaper (formerly The Manchester Guardian) and the passing of the 1832 Reform Act. ‘Sprawling’ and ‘lumbering’ are the two adjectives most applied to this film which is a missed opportunity. It educates but does not entertain and fails so often to engage with the audience. Peterloo (2018), dir. Mike Leigh, distributed by Entertainment One. Now in cinemas.